It is our mission to stand tall in a crowded field of competitors. 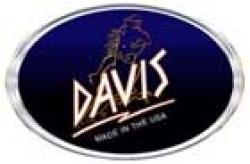 Did you know that every one of the products in the DAVIS line has not only been designed here in the USA, but are also 100% made in the USA? DAVIS employees take hometown pride in the hand worked craftsmanship that is displayed in every product they produce. Quality, durability, easy maintenance and maximum protection are all natural American made benefits you receive in every DAVIS product.